Fish Tanks, July 2016, Installation and Multimedia Performance, Duration: 25 minutes. 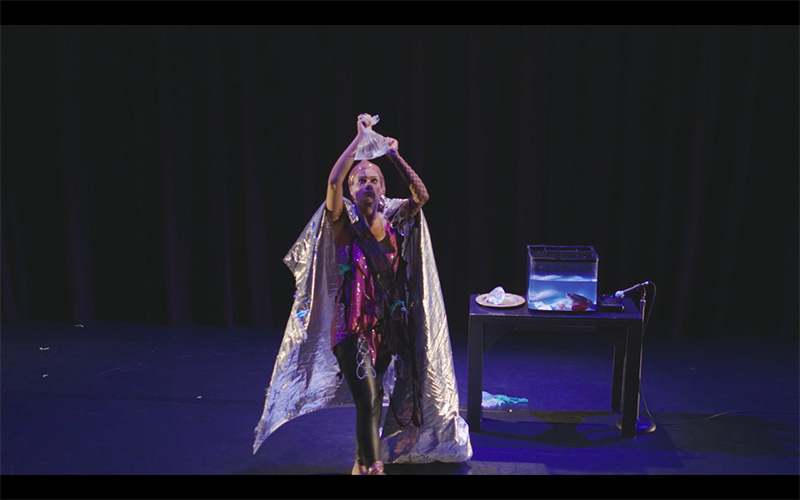 Ecologically fused, immersive, multimedia performance piece inspired by oceanic pollution, extinction of marine life and the current anthropocene. Fish Tanks uses dead tropical fish in an attempt to bring to our attention that there will soon be more plastic than fish in our oceans. In California alone, the numnber of plastic pieces outnumbers total marine life 6 to 11 in the immediate vicinity. Half fish- half woman, mourns her dead while playing a long desperate 'lets get back together voicemail.' This piece was first performed at Highways Performance Space in Santa Monica, California. Little bags with dead tropical fish and plastic were handed out. Music for this piece was composed by Nick Launay and Ming Vauz. LIC Ritual Performance, March 2016, Installation and Live Art Performance, Duration: 9am - 5pm. 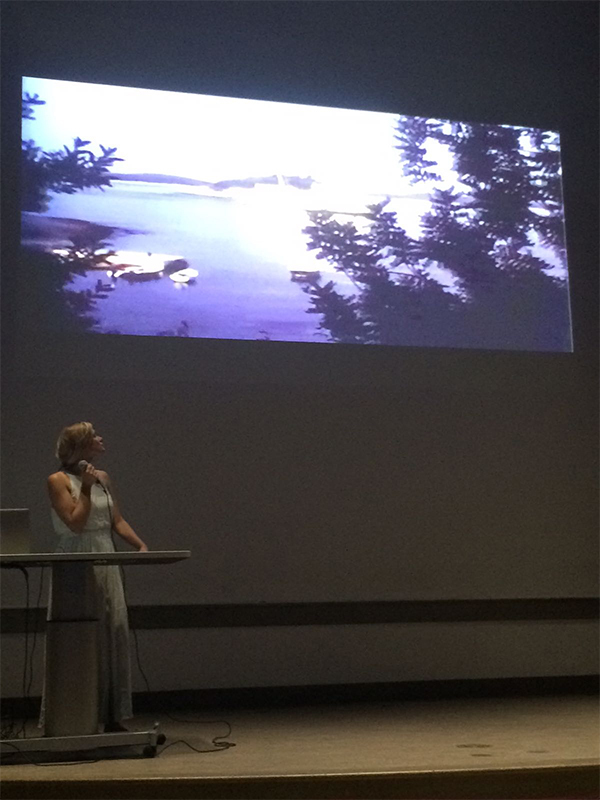 Performed at the backdrop of Manhattan skyline, LIC Ritual Performance explores everyday urban rituals which result in the accumulation of water pollutants in the East River. LIC Ritual Performance traces the formation of the river over 11,000 years up until the modern day and its current anthropocene. The duratonal aspect of the performance was used to emphasize how the river has to "work" to clean itself from the human mess in the same way humans need to work to survive. The Cockroach, December 2015, Installation and Multimedia Performance, Duration: 15 minutes. This is a physical theatre performance using dance, shadow play and a combination of sounds made by organic and synthetic materials such as leather, latex and wallnuts. Sara Debevec explores reproduction, abortion and meaning of life through the archetype of a cockroach. It was first performed at Pioneer Works in Brooklyn. It was later performed as a site specific piece in Glasshouse Art Space in a bathtub. Vala, October 2015, Performance, Duration: 30 minutes. Vala was a piece Sara made in collaboration with artists Ariel Kleinberg and Andrea Devina Clinton. The performance took place on 9 October 2015 in New York. The piece centres upon movement and dance. It was inspired by an ancient Indian myth about gods, demons and rubies. The piece explores animals as god like creatures and the point in time when animals transitioned from being considered godly to simply becoming creatures we like to objectify, dominate and abandon. 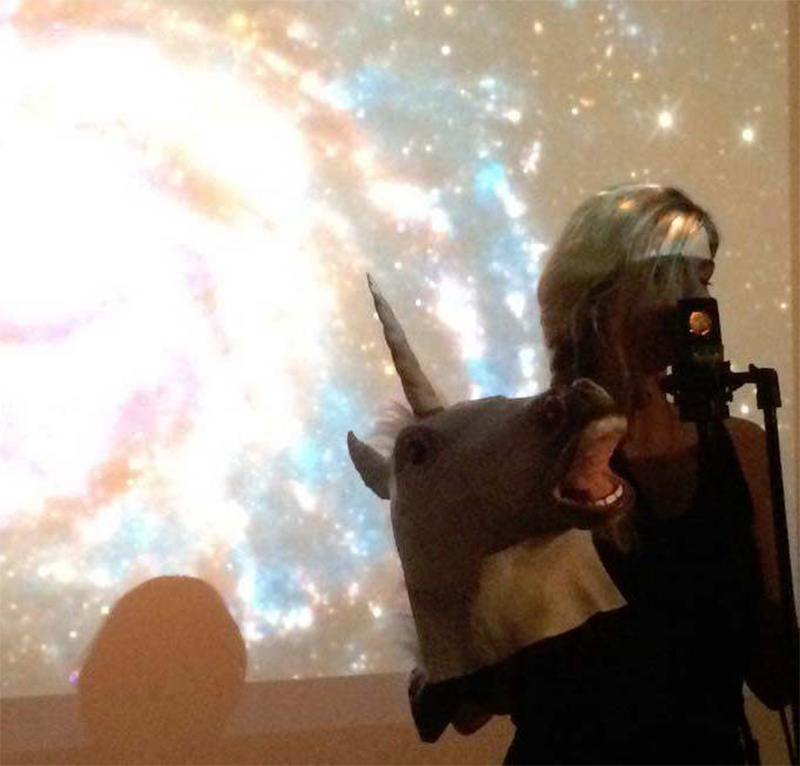 Mia and her amazing unicorn, February 2016, Installation and Multimedia Performance, Duration: 20 minutes. This is a multimedia spoken word performance imitating a children's TV show where Mia and her unicorn friend answer letters from children who are writing to them about topics such as death, masturbation, homelessness and sickness. As the show progresses, things get darker and darker when Bob vomits glitter and we learn he is going through chemotherapy. This piece was first performed in 2016 in New York at Psychlotron. Golya, District 8, Budapest, April 2015, Site Specific Performances, Duration: 2 hours. Creation of site specific performances in collaboration with 18 performers, directors, writers and visual artists from France, Ireland, Czech Republic, Spain, Italy and Serbia. The project was led by Belgian Dramaturg Bart Capella and Hungarian Director Marta Schermann as a response to the gentrification process of the 8th District in Budapest. The performance took place in Golya, Budapest, Hungary on 17 April 2015. Funeral inside my head, February 2013, Multimedia performance, Duration: 15 minutes. This is a multimedia art performance piece dedicated to Predrag Debevec, Sara's father, who passed away in 2012 due to Encephalitis (brain infection) caused by an unknown virus. The performance tries to capture the feeling of immense loss, pain and fear she experienced in the days before the funeral. The performance is also her way of saying 'goodbye' - a kind of ritual which did not take place. The performance uses a collage of two songs by Zbigniew Preisner - 'Concerto in e minor v.1902' and 'The Puppets'. Sara uses an actual MRI scan of her father’s brain in this performance. This piece was first performed at The Roundhouse in London in February 2013. Lone Rider, April 2011, Multimedia Performance, Duration: 20 minutes. Lone Rider explores human and animalistic nature through the narrative of a horse that has been abandoned by her cowboy - Big Bob, who is busy riding other horses. The act involves elements of burlesque cabaret and monologue. It was first performed at the Roundhouse in London on 2 April 2011. 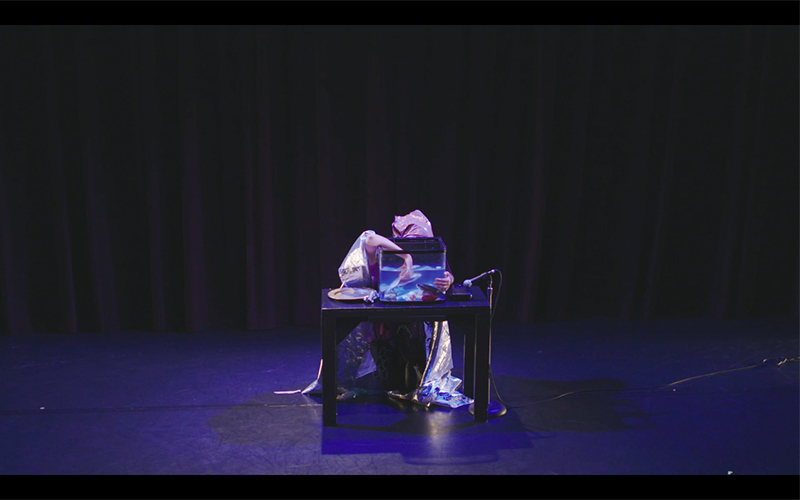 My Family Before Me, October 2016, video performance, duration: 30 minutes. Sara's family moved to Poland when she was only 2 years old and she spent most of her life in exile. When her father passed away in 2012, she found hours of super 8 footage which he filmed in former Yugoslavia, before she was born and before the war broke out in Sarajevo. This is her video performance exploring her relationship to her family, trauma and country which no longer exists. I am a multimedia performance artist and writer with a background in Sociology. My artistic practice stems from avant garde cabaret and I like to explore gender, identity, belonging, states of being and the anthopocene, through animal archetypes. In the past, I have performed as a jealous horse, a homeless snail, a disorientated moth, an intrusive fly and a devastated fish. Although seemingly light hearted, my performances use dark humour to satirize and illuminate social identity. I am greatly inspired by animals as I find that through creating animal monologues, I am developing a new form of storytelling. Animals are submissive to people and I believe power relationships that exist among humans can be well represented and embodied through animal ethics. I am interested in the anthopocene and what the psychological consequences are of destroying our environment. Through my installations, I create sombre, dark, post apocalyptic and lonely environments where I invite the audience to reflect on the organic loss and decay we are responsible for. Strong imagery, language and costume are key to my practice. 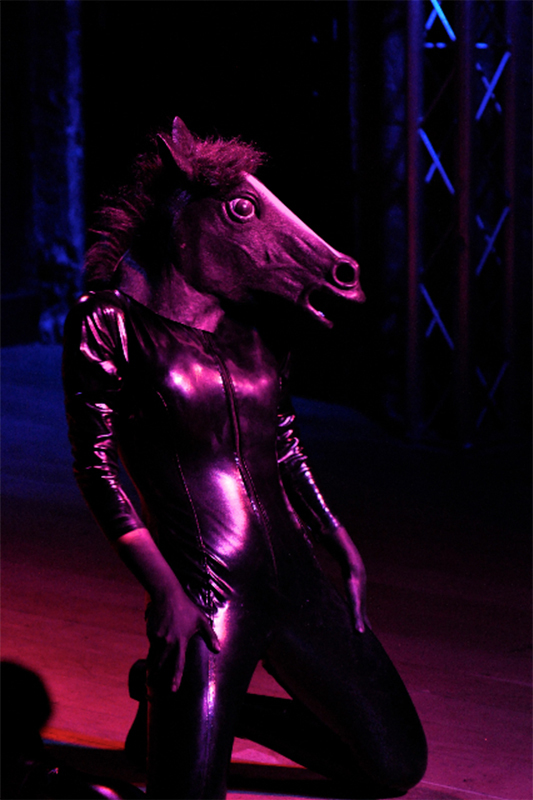 As a female performer who attempts to embody unusual animal archetypes, I ask the question “Why can’t feminine, be portraying traditional masculine animalistic?” Using outfits that strongly emphasize the female form, I aim to break boundaries of subjectivity and gender classification using my body. I aim to engage with the audience in a way that sparks curiosity and debate. My work doesn’t seek to answer questions but rather pose questions by embodying them. Family Ties: Kinship, Collaboration, and Power in Film and Media Conference: University of Pittsburgh, Pennsylvania, USA, October 2016. Highways Performance Space & Gallery, Los Angeles, USA, August 2016. Panoply Performance Laboratory PPL, Performancy Forum: Entrapment, trappings, vermin and rapture, Brooklyn, New York, USA, February 2016. 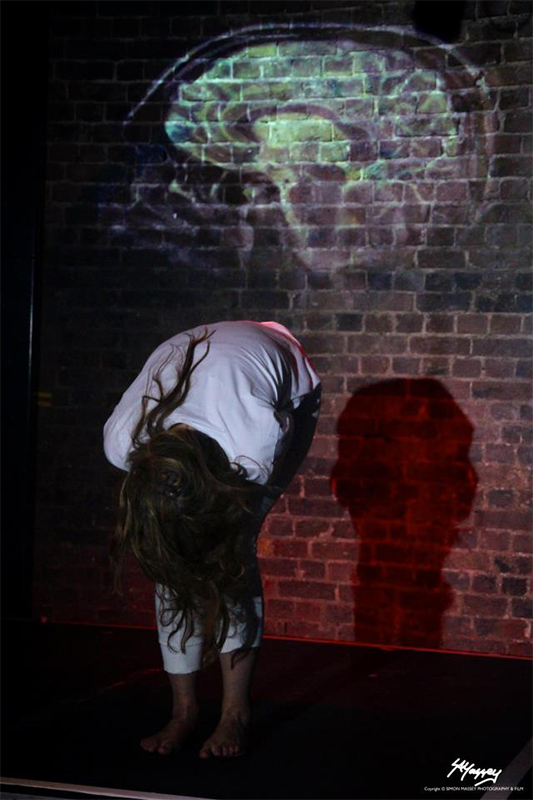 *Shadow dance, physical theatre and monologue performance as part of a Performancy Forum. Glasshouse, Plays of Domesticity, Brooklyn, New York, USA, January 2016. *Experimental performance in a bathtub entitled Cockroach as part of Plays of Domesticity. 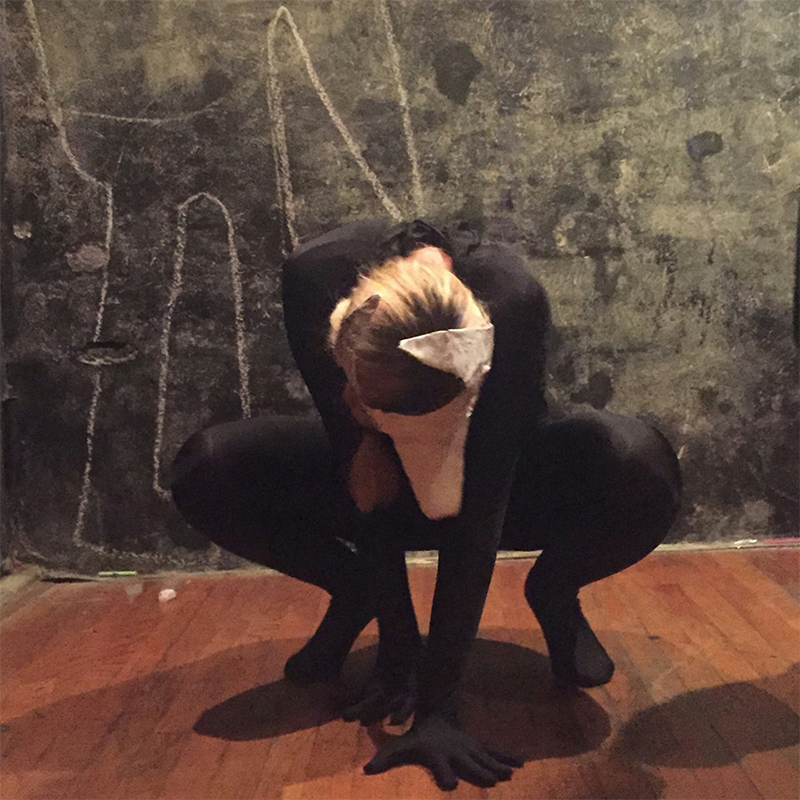 Pioneer Works, Performance Art 101 Showcase, Brooklyn, USA, November 2015. Greenhouse Berlin, THE SHELLS, Berlin, Germany, June 2015. *Devising and performing in an immersive theatre show led by Kirsten Brandt and Jos Porath inspired by David Lynch’s TV-drama Twin Peaks. 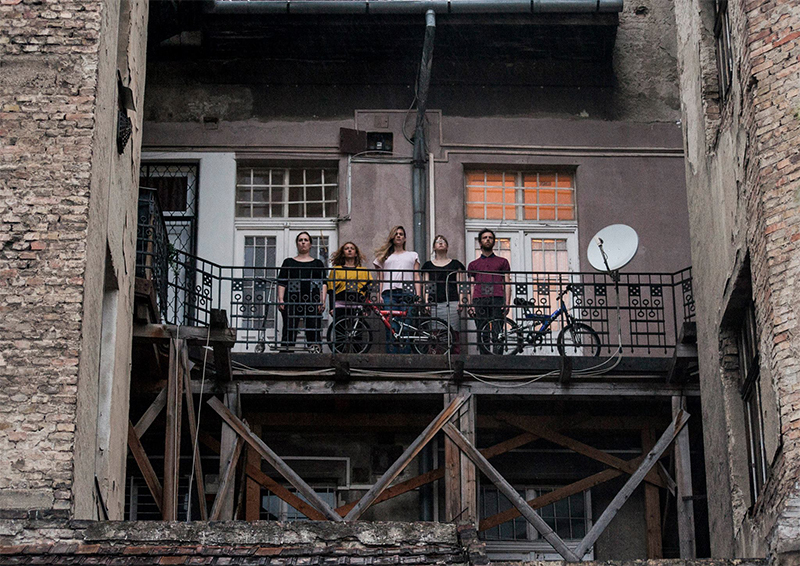 Gólya Presszó, INSITU Site Specific Performances exploring District 8 Gentrification, Budapest, Hungary, March 2015. *Creation of site specific performances in collaboration with 18 actors, performers, directors, writers and visual artists from France, Ireland, Czech Republic, Spain, Italy and Serbia. Café Karma, Londyński Kabaret Chalk Dust, Warsaw, Poland, October 2014. * Curated an avant garde cabaret evening bringing London performers to Warsaw for one night only. 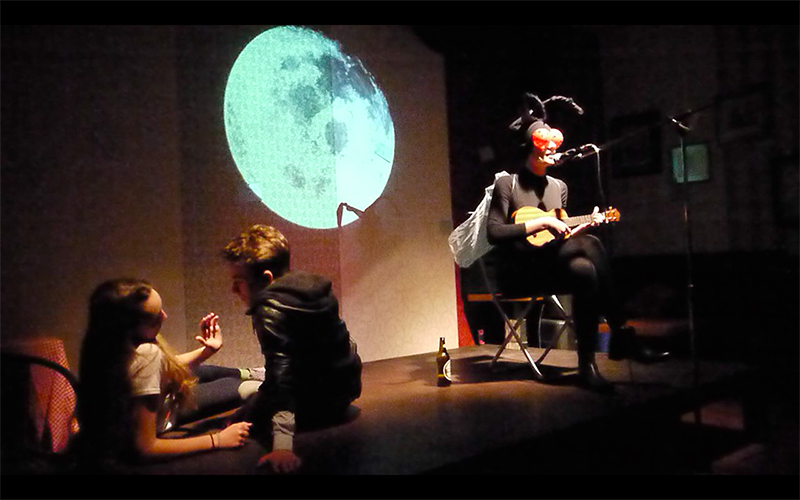 Performed Lonely Fly as part of Chalk Dust Cabaret Showcase. Café Karma, Wieczór poetycko-muzyczny na rzecz ofiar powodzi na Bałkanach; curated a spoken word fundraiser in support of floods in Serbia, Bosnia and Croatia. June 2014. Klub Komediowy, 10th Spoke’N’Word Festival, Warsaw, Poland, December 2013. The & CO.,Hackney Arts Studio, collaboration and performance in an avant garde film by Elsa Philippe, London, UK, May 2012. Camp Bestival, Marisa Carnesky’s Tarotdrome, Isle of White, UK, July 2011. Glastonbury Festival, Cabaret Tent, Somerset, UK, June 2011. The Roundhouse,Marisa Carnesky’s Finishing School: Pandemonium, London, UK, May 2011. Benjamin Millepied’s L.A. Dance Project at The Ace Hotel Theater, Spot LA Blog, December 15, 2016. Lucinda Childs, A Portrait (1963-2016), Spot LA Blog, November 25, 2016. Bodytraffic at The Broad, Spot LA Blog, November 3, 2016. Dance Performances Culminate Month-Long Recognition of Forsythe’s Work by The Music Center, USC Kaufman School of Dance and LACMA, Spot LA Blog, October 27, 2016. California State University, Long Beach – College of the Arts & the Department of Dance, Spot LA Blog, October 19, 2016.